The diabetic retinopathy is the second cause of blindness in France. The diabetic retinopathy especially affects the active population aged between 20 and 55 years. It’s about an affection of those who suffer from diabetes, manifested around the deterioration of the blood vessels from retina. At some people, the blood vessels crack and break into the retina. 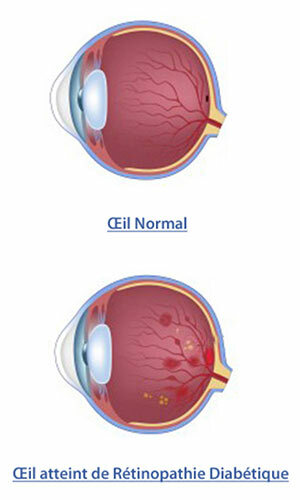 At others, develop abnormal blood vessels on the retina surface and the vitreous body. The loss of vision can be provoked in two ways. First, abnormal and fragile blood vessels can break and bleed in the middle of the eye and on this way blur the vision. This is called proliferative retinopathy and represents the most advanced stage of this affection. In the second place, it can drain liquid into the center of macula, inflating and blurring the vision. There are no symptoms on the debut of this affection, but when the macula (responsible for the central vision) is affected, it produces a loss of detail vision. The diagnostic is established from a complete ophthalmologic exam with drops of dilation. The more advanced cases also require effectuation of an angiography (fundus exam using an fluorescent pigment) or OCT. The usual treatment stays in photocoagulation with laser, which stops or slows the blood leakages and of the liquid from the eye and contract the abnormal blood vessels; sometimes it had to resort to intravitreal injections with cortisone or anti-VEGF and, lastly, surgically, with vitrectomy and laser.